Apothecary Art and the Framelets -- new class this week! Good morning all! Today I have a few quick samples from this week's upcoming Apothecary Art card class. I hoped to do a combination class with the Adorning Accents as well but there's just so much good stuff to this Apothecary Art stamp set! I'll have to save that for another time! In the meantime, here's what we'll be making -- I case'd most of these from the Stampin' Connection demonstrator website since there are some fabulously-talented demonstrators out there! Why re-invent the wheel when you have samples and talent at your fingertips?!! Here they are! They use a variety of DSP's from the new Spring mini catalog: Twitterpated, Attic Boutique, and the Everyday Enchantment paper (from the Sale-a-bration catty that becomes available to all with the $50 order starting on Tuesday! Yay!). Although it wasn't my focus, I did use the Adorning Accents embossing folder and die for my Marina Mist, along with the dotted line from the Bordering on Romance matching stamp set for these dies and folders. I used the Bitty Box to make a cute little box using the incolors of Calypso Coral and Pool Party for the tiny candy box we'll be making -- in case you can't see (since I don't have a closeup photo yet), the middle of the smallest image from the Apothecary Art set is colored with markers. Well, that's all for today! Maybe this evening or tomorrow I'll upload closeup photos of each of these cards! p.s. 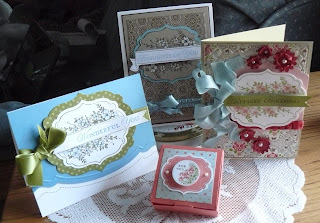 My class is in Lynnfield, MA on Tuesday evening, 7 p.m. - 9:30 p.m. and will cost $20 for the 3 cards and small candy box. As usual, I do all the prepping including scoring and cutting layers so it's a fun escape from everyday hassles! Come color and create with us! Just a super-quick post to say that I really am here although life has dealt our family a crazy blow these past few months! However, I've been stamping and I want to quickly share my Demonstrator group swap card using some new stamps and toys from the Spring Mini Catalog! I used the new Edgelit Adorning Accents die with the new Adorning Accents Embossing Folder. The DSP is the new Twitterpated, and the little hearts were punched out with the small heart punch using the carried-over Red Glimmer Paper. Don't you just love the shimmer and shine of this paper?! And, although it's not supposed to lose even a speck of glitter, my husband can always tell when I've been playing with this lovely paper! He seriously thinks I roll in my glitter!! I have to admit ... it's probably my favorite embellishment! LOL! Oh yes ... I do love my Cherry Cobbler seam binding too! 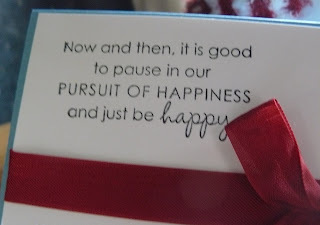 The sentiment on this card is one of my New Year's resolutions (although I tried to resolve to have none this year! LOL!). We are so busy rushing around, trying to enjoy life, that sometimes we miss the point of living in the moment! Well, after the fall we've had with my mother-in-law and her relapsed cancer, I am always going to try to live in the moment from now on! In case you're wondering, this beautiful verse is from the Pursuit of Happiness stamp set! It's a beauty!! Happy stamping ... and ... Go PATS! !